In a previous post: How to create a dynamic pivot table and refresh automatically I demonstrated how to refresh a pivot table when a sheet is activated. 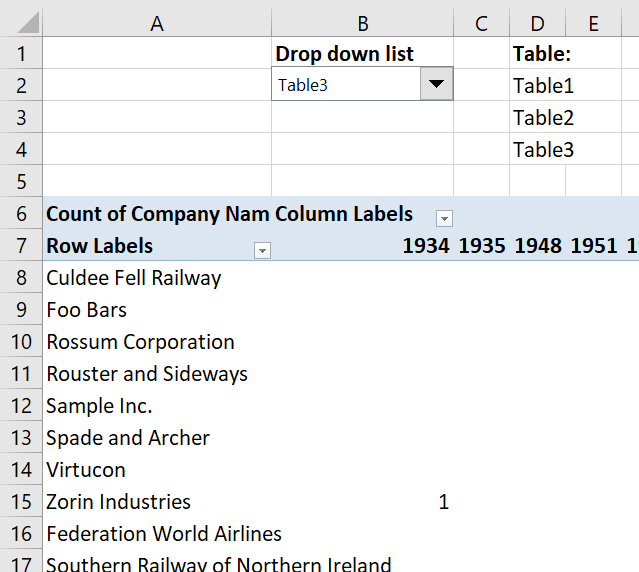 This post describes how to refresh a pivot table when data is edited/added or deleted on another worksheet. That is why you have to manually change the source cell reference and refresh pivot table, this is very easy to forget. However, this article solves your problems using an excel defined table and three lines of event code. 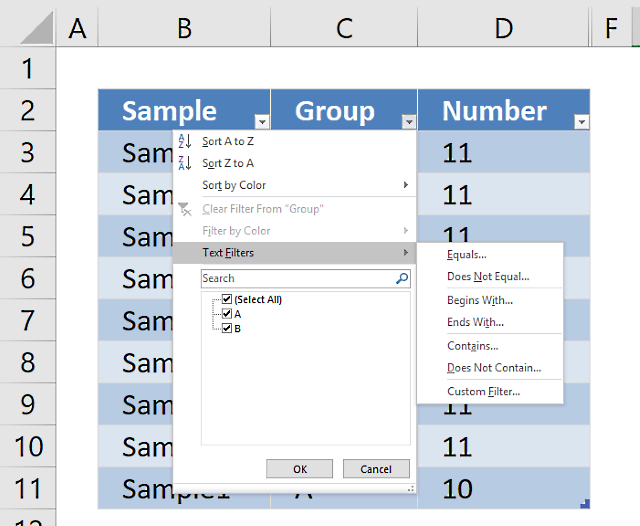 In this example there are two worksheets, "Data" and "Pivot table", to make it simple. 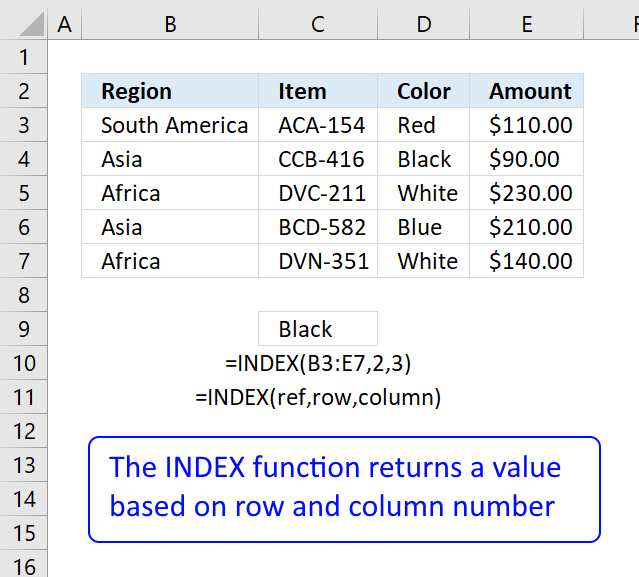 The following image shows you some of the data on worksheet "Data"
Excel is not smart enough to know when you have added values to your data, the source cell reference won't adjust automatically. However Excel defined tables (Excel 2007 and later versions) has that feature and luckily it is easy to implement. 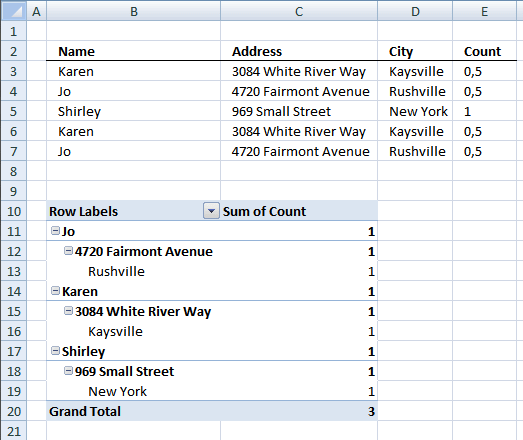 You will also need event code to refresh your pivot table but first let's build an Excel defined table. The named range formula below is dynamic meaning it automatically expands both horizontally and vertically while adding new entries or columns. Type in "referer to:" field. 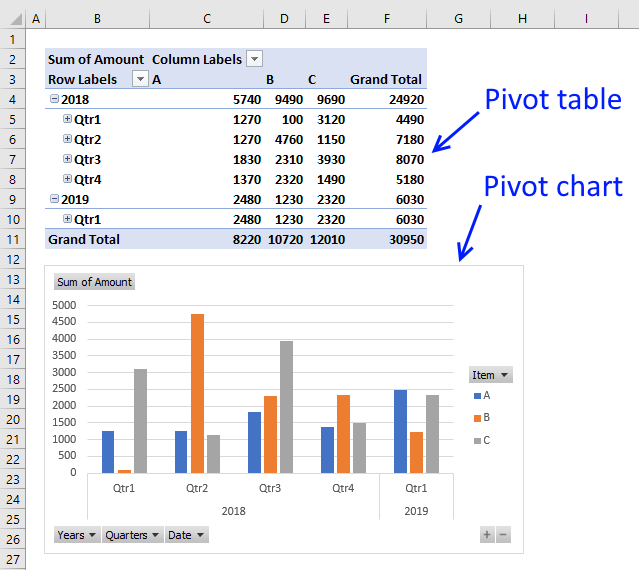 If you already have a pivot table, skip these steps. The following event-code must be placed in the same sheet as your data is. Whenever you edit/add/delete data, event code is executed. The downside is that it refreshes the pivot table every time you add data to a single cell, this may slow down your workbook on an older computer. 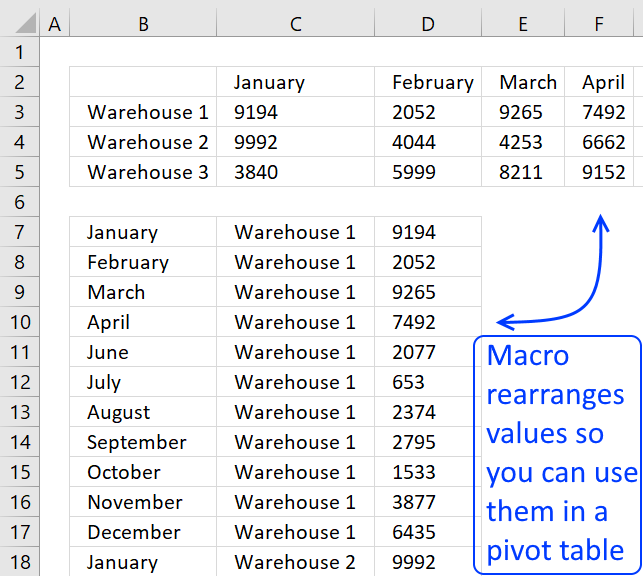 Read this post if you'd rather refresh your pivot table when you activate pivot table worksheet. Click "Developer" tab on the ribbon. Double click on "Data" sheet in project explorer window. Insert event code into worksheet code window to the right of the project explorer window. The code is copied into the code window for sheet "Data". The Worksheet_Change sub is executed when a cell is changed in sheet (Data). This line of code refreshes the pivot table on sheet Pivot table whenever a cell is changed on sheet Data. Click on any cell in your pivot table and go to tab "Options" to see the name of your pivot table. Make sure to use that name in code above. Your pivot table is now instantly refreshed whenever a cell value on worksheet "Data" has changed, and the pivot table source data range is adjusted if values have been added/deleted to your excel defined table. thanks for this cool tip! btw, if i have another Pivottable (using different pivotcache), can i add an additional line? Yes, that works. Make sure you have the correct sheet and pivot table names. 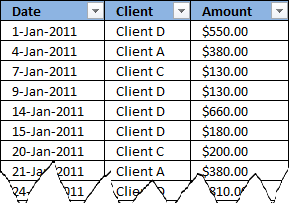 i noticed there is a problem on pivottable with grouped dates. my Data sheet is an Excel 2010 Table. Data is daily stats, therefore i add new daily data below the Table. whenever new data is appended to the Table (new daily data), the PivotTable will automatically "ungrouped" (grouped Dates --> single Dates). I had to manually regroup the dates again. It seems that the pivot table preserves formatting if you copy and paste data to your table or dynamic range. 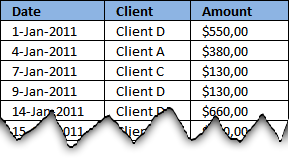 When you move a cell range to the last row of a table or dynamic range, pivot table formatting is lost. 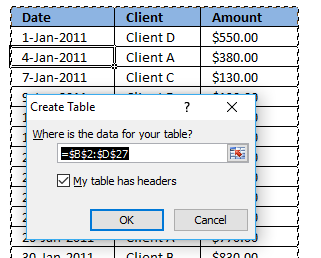 Try copy / paste next time you append new data to your table. fyi, i performed copy-n-paste "value only" when i append the data. anyways, this alternate macro suits me as well. When I try this with Excel for Mac 2011, the sheet appears to get stuck in a loop where it's recalculating the sheet over and over again. The only way to get out is to force quit Excel. Thank you for very helpfull function. Please share how to save. Because, After create this , save and close this excel, and I open this excel file, but this VB didn't exist. Please inform me how to save. Thank you for your advice. Once more, please assist me. All of macro was run smoothly. But, I found that "UNDO" was deactivated by system. How to activated "UNDO". Yes, the undo stack is lost. I was wondering if there is a way to refresh when the data that is being changed is in a controlbox. I'm using active x controlboxes to select from a list which in turn will adjust prices and so forth. If I change a selection in the controlbox the pivot table is not updated. The script is working if I change a data entry manually and hit enter to tab to move to a new cell. Right click on sheet name. Click "View code". Change combobox name. Copy/Paste code. Simple, straightforward information. Thanks very much. whenever i update the Data sheet. Did you change the names (bolded)? Great tip. However taking it a step further, can the pivot table only update when 1 cell is changed, and not any cell on the tab. Example say I only want the table to refresh when cell AB4 is changed. Macro works but then it is preventing undo..any workaround for that? after applying the method the "undo" command doesn't work..any solution?? I have specified the correct workbook and piveot table, and, for a short time, I can see the values to change... The problem is that this seems to make excel to run an infinite refreshing loop which causes excel to crash. 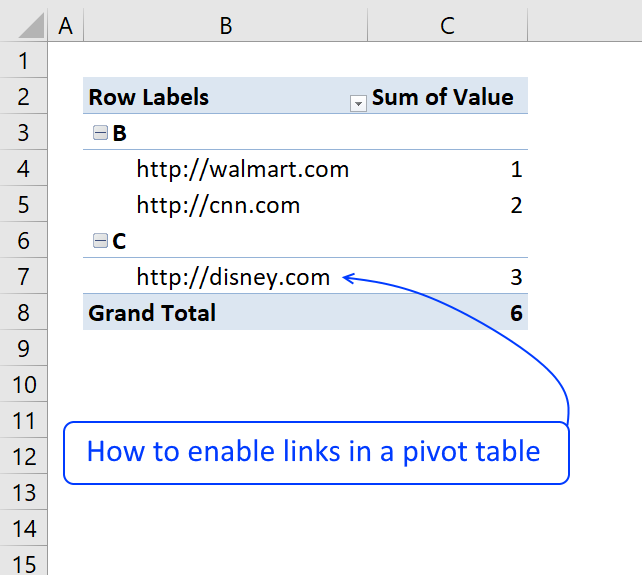 If pivot table and source data are located on the same sheet excel goes into an infinite loop. I have an (Excel 2010) expense Claim report design which has the Expense Data (Table2) on the same sheet (Expense Claim) as a pivot table (pivottable1)which summarises the claims by expense type. Your suggested macro above works nicely to auto refresh the pivot anytime I add in an extra expense claim item, but to allow others in the company to use it I need to protect areas of the claim form - otherwise they mess up. The Auto Refresh macro doesnt work when I protect the sheet. Is here a few lines I can insert into the Macro to fix this? I'm having the same problem. after update 1 cell the pivot table refreshes but i get the message: Run-Time Error -2147417848 (80010108) Method 'Refresh' of object PivotCache Failed. Joao, read my answer to Filipe. That is brilliant, thank you so much. 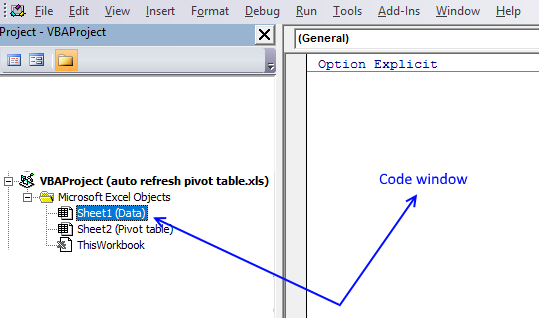 The specific workbook I have happens to have two pivot tables populated from the same table source, and in that case I could not tweak your code to make this possible.. it keeps refreshing for long time.. With only one pivot table works really great. would you mind explaining why there will be an infinite loop when the pivot tables and source are located in the same worksheet? Oh, I seem to get it. Is that because after refreshing, another change event is triggered? Yes, when the pivot table refreshes the change event is launched again. Great, great, great, thank you so much, this is great! Thank you for the post. This is great! I come an issue when using this though. I have a workbook with 2 sheets and derive 5 pivot tables from each sheet (10 pivot tables). I tried the code with 5 lines (1 line for each pivot table) in each sheet initially, then changed it to a single line for each sheet. But still excel continuously executes the query and doesn't stop. I need to press 'Esc' and 'Debug' in order to stop it. Looks like Excel has a single Pivot cache for all 5 charts from a single sheet. Thus I used a single line of code to refresh the pivot cache. Can you please confirm if this is correct? I think the continuous execution of the query has stopped for some reason and it works fine now. Thank you very much. Thanks for your postings, I hv used this short sub-routine and it works. My problem starts only when i applied a sort order (in Descending Order) on the first column of my pivot table that contains a date. Everytime that a new data is added on the source sheet, my sort order in the pivot table scrambled and out of order. My question to you now is - How to keep the sort order intact when there is/are data change? Can you add on above sub routine code something that when data refreshes, the sort order refreshes also to DESC order? Thanks a lot for all the useful information you provide here. I downloaded your example file and it worked, although it says on the top it runs in [Compatibility Mode]. Now I don't manage to get the code executed in my orginal file. I even copied your worksheets into my Excel file, and then the automatic update stops to work again. Am I right assuming that nothing with the code is wrong, but some settings in my Excel prevent it from running the code? Any help where I could look is highly appreciated! did you check the sheet and pivot name? I assume you have other names? This is really helpful. I have one question though. How do you tweak the codes when the source data is stored in a separate workbook? Thanks a lot for your help! I already got this to work in some of my routine jobs! I'm searching your site for other things that can help me more. Great job for you! Have a pvot table for monthly reporting of #sales made by each sales paerson. 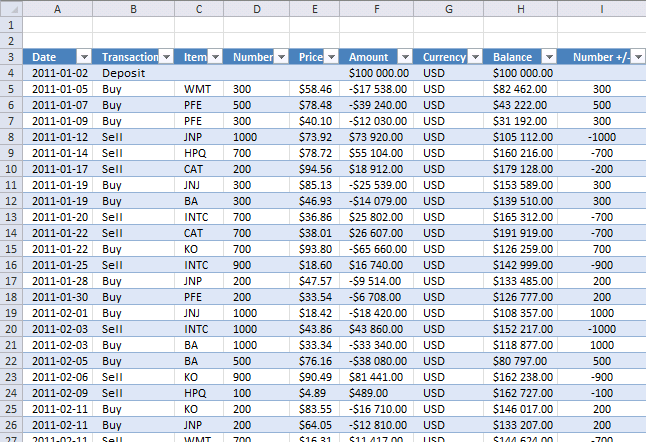 Data is generated from a SQL quarry, capture the data and recreat the the table of report by pasting is to Excel. This done every month, I wonder if this table can be made dinamic so that it can pull the data each month from the quarry? I need a little help on how to automate grouping (categories are: 1-30, 31-60, 61-90, 91-120, 121-180, 181-210, 211-240, 241+) in a pivot table and create a macro to automatically update them each week from data source, and will populate pivot totals in another tab. I have 6 weekly reports that I have to create about 20-25 pivot tables for each, each week. I can send a copy of the file, if you would like to take a look at it. The code works while i am in the sheet however once I save, exit, then reopen the sheet - the refresh no longer works... I am unsure what is going on. Save the file as a *.xlsm file. I have the following issues. Any suggestions. * primary and they are between 4 to 6 years. Kindly let me know of any specific formula e that I can use. Thanks so much. It did not work the first few times I saved it that way ... but the third time was the charm and it stuck. Thanks so much. Thank you.. it's very helpful for me. Thanks very much! very helpful!!! 1. Every time I change data in the 'data' sheet, excel demands confirmation to replace the contents of the destination cell in the sheet containing the pivot tables. Any way to bypass this? I noticed your example does not seek confirmation, so I know it's possible. 2. Is there any way to protect the sheet with the pivot tables from end users manually changing data within the pivot tables and still allow them to be refreshed? I need them placed into graphs showing the time line from 2010 to present. We need to measure three areas on a monthly bases; frequency of events, total amount of claim for the month and unit count for the moth. I need it in a three bar graph and line chart with three spate lines for each measurement. I am looking for a code to refresh my data from ODBC on the first day of the month by 4 a.m. without having to be on the computer to open the excel file. I have VBA code to refresh Pivot Table that works wonderfully (except loosing some center text and a few boundary lines.) Now I would like to insert code to Refresh the sheet when it is protected via a macro button placed on the protected pivot table sheet. 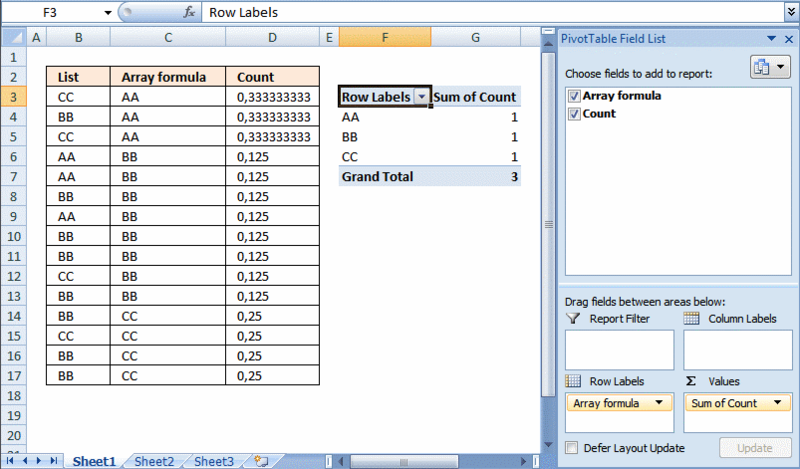 The data source is sheet 2 (named 'PRev') and the pivot table (named 'PivotTable1A')is on sheet 1 (named 'Scott PT'. 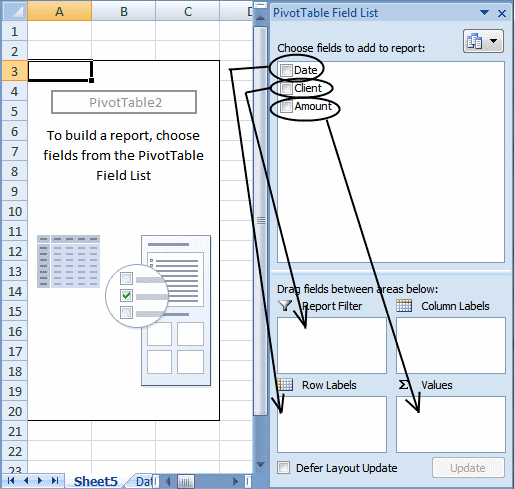 'The following code applies to PivotTable(1) on the active sheet.
' 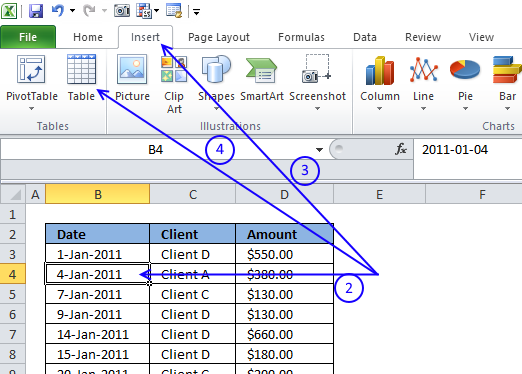 in the PivotTable to "Sum Amt" or "Sum TtlAmt" respectively.
' 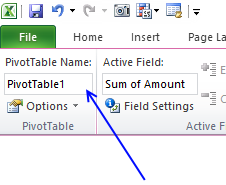 but only if the field is named "Amount" or "Total Amount"
Right-click the sheet tab of the sheet containing the pivottable. Select View Code from the context menu. Double-click the ThisWorkbook node in the project explorer on the left hand side of the Visual Basic Editor. where Sheet1 is the name of the sheet containing the pivottable. can you explain in greater detail? I added this code to a report that I developed and when other users with Excel 2013 open the file, they get a VBA Runtime error. However, there are two workbooks that it is in and only one of them gives the error. It is acting like the table names or sheet names are not correct but I have double checked everything and also compared the two workbooks. Any thoughts? Would the newer version of excel be causing issues? Thanks for the help and the code! It is acting like the table names or sheet names are not correct but I have double checked everything and also compared the two workbooks. Any thoughts? No other than the ones you mentioned. Would the newer version of excel be causing issues? thank you for your great post! My problem is actually quite different. I would like indeed to refresh automatically my pivot table whenever the source table is changed. The problem is that my source table ist not directly edited, but is a result of several other tables and computations. If I use the event "Worksheet_Change" it doesn't really work since Excel doens't trigger the event when the source table is recalculated (other changes are of course correctly handled). On the other hand, if I use the event "Worksheet_Calculate" then I can handle the situation but every calculation on the entire sheet will trigger the event and hence the pivot table refresh. Is there a way to combine both things, that is, that the pivot table is automatically refreshed when the source table is either changed or recalculated? Oscar EXCELLENT help for VBA simple routine on AUTO Pivot Table update. I have a pivot table sourcing data from another pivot table (on the same worksheet); can I get the second pivot table to automatically refresh when the 'master' pivot table is updated? Oscar, you sir are a steely-eyed missle man! I do the same exercise as you explain above but when i close and again open the workbook its not working. Whenever I refresh a data, the numbers changes its format to dates. but from my source data, the data is still in numbers.. The basic code works for me for refreshing, but i then lose the cell border/highlight when moving around the workbook - ie. i cant see which cell i'm currently in.... any ideas on that one? Thank you so much for your help. That was very helpful ! the post is really informative and helpful. I have multiple pivote tables and multiple source data sheets aswell..
for example in workbook 1 , i have pivot1 which is generated from the data of sheet1 and pivot2 from sheet2...so on. I can write code in specific sheets to refresh respective pivot tables but How can i keep the code in single macro? so that it would be easy to make changes or debug if required. Hello Oscar, this is very cool, however I have an added complication, I'm hoping you can help me with. I have other sheets feeding into my data sheet which then feed into the Pivot table. So when a change is made in the data sheet it is via a link not an actual user action in the cell. This results in the pivot table not refreshing. Do you have any suggestions of how to make this work. Otherwise the pivot tables have to be refreshed numerous times to update all of the data. I'm new one in this group and i already read ur post which help me greatly. would u be told me that how to keep equal distance among several columns after refresh. Because when i refresh the pivot sheet then it scrambled how to keep it equal distance between column. When I use your original VBA on a pivot table with that works from a range that has values only it works automatically. When I try to use in on a range that contains the results of formulas I have to manually refresh. Is there a way to make it work automatically from source data that contains formulas? Is there a way to make it work automatically from source data that contains formulas? 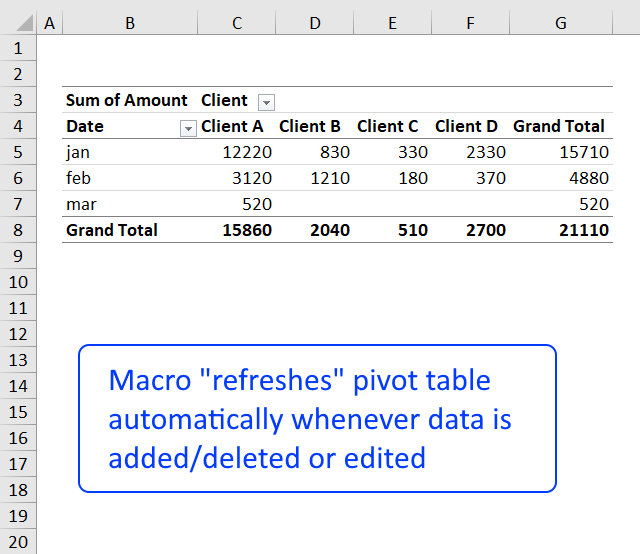 This post shows you how to refresh a pivot table when you activate a sheet, is it something that would work? If not, your formulas must work with a data from somewhere in your workbook? You could relocate the event code presented in this post to the sheet where your data is located? Hi, thank you for the trick! I have multiple Worksheets each one with one or more Pivots. What if I want to apply the above code to all the pivots and worksheets? Make sure you put the event code above in "ThisWorkbook" module. Note, this will only work as intended if the source data is on the same sheet as the corresponding pivottable. I am new to Macro. Please let me know the code through which pivots can get refreshed even when data is added/increased. When I remove some data, it gets updated automatically through the above code but once data is increased it does not gets updated because of range issue. Please help. Yes, the event handler Worksheet_Change won't be triggered if a cell is linked to another sheet even if the linked cell value changes. A simple solution would be to use Worksheet_Change on that worksheet as well.